THE eastern arm of the church, in its present state, affords specimens of every style of architecture ' from the Conquest to the Reformation, and it is greatly to be regretted that so little of its history has reached us, with the exception of the beginning of the work. In 1202, "the bishop instituted a confraternity for the reparation of the church of Winton, to last for five complete years." And in the Obituary of John of Exeter we are told, that "Godfrey Lucy made the vault with the aisles from the altar of the blessed Mary to the end (of the church), where he was buried outside the chapel of the blessed Virgin." This last entry proves that the works of Bishop de Lucy were the eastern portions which lie between the altar wall of the Lady-chapel and the gable end of the church, the style of which is Early English, of an excellent character. This example is therefore worth examining as a well-dated building, as well as for its beauty. Now in the general plan ..., the plan of the crypt is indicated in ... [light blue] , to show its relation to the work above. It shews that the Norman cathedral, the high apse of which terminated at Q, where the present gable stands, had a circular aisle round the end of it. This aisle, however, had towers R and S on each side, so that the external outline of this end of the church is reduced from a semicircle to a square. From the centre projected the chapel T, which may have been a lady chapel, or, as at Canterbury, may have been dedicated to the Holy Trinity. Such flanking towers were not unusual. At Canterbury the towers of St. Andrew and St. Anselm similarly flanked the Trinity chapel, but were beyond the line of the aisle to north and south. In the crypts of York the towers seem to have been placed as in the present example. It is probable that in the parts above the crypt the square outline would disappear. Indeed, as the outside of the wall is at present buried in the earth, we have -no means of ascertaining exactly how far the towers are detached from the circular apse. De Lucy's building extends from L P eastward, and is distinguished by [the red] tint in the plan. The whole is nearly of the same height. 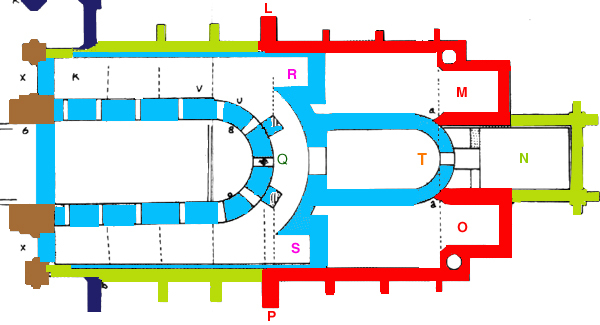 It consists of three aisles or alloys, separated from each other by three arches on each side, and the central alley is very little higher than the lateral ones ; each alley terminates eastward, with a chapel; of these the lateral chapels M arid 0 still retain their eastern walls, but that portion of the central or Lady-chapel N, which projects beyond the others, is the work of Prior Hunton, at the end of the fifteenth century. This prior erected a crypt under his chapel., the vault of which is carried by two central pillars, and the vault is thus divided into six compartments. But this crypt is not confined to his own additional part of the chapel, for two of its compartments extend under the original Lady-chapel of De Lucy. The crypt of the latter being thus obliterated, it is not easy to discover whether De Lucy s chapel extended further east than the two lateral ones, or whether the three chapels were all of one length. From some indications that appear to mark the Springing of the original east wall in Hunton's crypt, I am inclined to think that the chapels of De Lucy were all of the same extent. The Lady-chapel itself presents a singular mixture of style. The north and south walls in their western compartment retain the rich Early English arcade and alura of De Lucy. The eastern compartment on each side, as well as the cast wall, have respectively a large Perpendicular window of seven lights, with transom and tracery of a peculiar kind of subordination, or rather interpenetration of patterns, well worth a careful study. footnote z The vault is a complex and beautiful specimen of lierne work. The vaulting-shafts have capitals and bases (figs. 15. and 16.) of an unusual form, but very rich and appropriate. The western half of the chapel is fitted up with elaborately carved panelling, seats, and desks, and a skreen of separation, all of the most beautiful and perfect workmanship and design. The lower part of the walls of the eastern half have been painted, and the remains of the painting still exist. These paintings have been minutely represented and described by Milner, in Carter's Specimens of Ancient Sculpture and Painting. footnote a The western arch of separation between the Lady-chapel and the aisles that connect it with the choir of the cathedral retains the moldings of De Lucy, but not the form in which he left it, for to accommodate the vault of the fifteenth century it has been evidently taken down and reset in the shape of a four-centred arch. The evidence upon which this chapel is dated was first pointed out by Milner. On the vault round the two central keys footnote b >one representing the Almighty, the other the blessed Virgin, we find the following characters and rebuses: the letter T, the syllable the figure of a ton for Thomas Hunton, and the figure I for prior. In like manner we see the letter T, the syllable silk, a steed or horse, and the figure 1, for Thomas Silkestede, prior. In other parts of the chapel and cathedral we find the letter T, with a skein of silk twisted round it, to denote the same person, with the vine and the ton (for Wynlon). There are other proofs from the arms of Queen Elizabeth, daughter of Edward VI., and those of the Grey family, that the addition to this chapel was begun to be built whilst Hunton was prior, but that it was finished and ornamented by Silkstede. The latter fact is attested by an imperfect inscription under the portrait of this prior, which is still visible, with the insignia of his office over the piscina in the chapel, of which the following words are part: " Silkstead ... jussit quoque saxa polita, Sumptibus ornari, Sancta Maria suis." footnote c Prior Hunton held his office from 1470 to 1498, when he was succeeded by Silkstede, who died in 1524. This places the date of the additions to De Lucy's chapel at the end of the fifteenth century. The architecture of this early specimen of the style is remarkably elegant. It has been well illustrated in Mr. Britton's plates. The doorway shewn in fig. 18 maybe taken as a specimen. It is one of those which lead from the aisles to the small turret staircases at their east ends. The peculiar arrangement of these low eastern aisles may be compared with those of the cathedrals of Hereford, Salisbury, Chichester, St. Alban's, Wells, and Exeter. Of these Winchester is the most extensive, and Hereford the earliest. footnote g The low eastern work of Hereford consists of two compartments of pointed Norman leading to an Early English Lady-chapel, and flanked by low Decorated transepts. The distribution of the piers in the low eastern work of Wells is peculiar complex, and produces a beautiful effect. It appears to me to have been contrived with the especial purpose of facilitating the circulation of the processions, for which all these aisles were formed. Gervase has told us footnote h that care was taken to accommodate them in the eastern aisles of Canterbury. William of Worcester applies the term " via processionum" to eastern aisles, footnote i and in English vocabularies they are called the "procession path." footnote j In most of our larger churches, however, eastern additions are raised as high in the centre as the choir itself, as at Canterbury, Rochester, Ely, &c.
The portion of the church which lies between De Lucy's work, and the Norman central tower and transept, is of a most curiously mixed description. Three pier-arches on each side extend eastward from the tower; two of broader span then follow, one on each side, inclined to each other so as to give an irregular polygonal form to the east end footnote k ; and at the east is a double arch which carries the gable, and divides the presbytery from the low eastern aisles. The piers of these arches will be seen by the plan to rest upon the walls of the Norman crypt. The western piers of De Lucy's work, however, having been erected at first so as to stand clear of the Norman apse, were supported on supplemental piers erected ill the crypt below. At U there still remains the stump of one of the Norman piers. Its simple base is shewn at right, and in A of Figure 39 . It stands immediately over the crypt pier, and it shews that there were four of these cylinders in the curve of the apse. If the whole of the piers of the Norman choir stood thus immediately over the centre of their corresponding crypt piers, there would have been four pier arches in the straight part of the choir, and five in the curved part, instead of the present arrangement of three in the straight part, and four in the polygonal walls. But these arches must have been narrower than those of the nave and transept. The present compartments are about equal in breadth to those of the nave. The plan of the piers of the choir is shewn in Figure 4 and figure 6 is the plan of one of the three small eastern piers that carry the gable. But the manner in which the arches of the cast end join these piers, and those of De Lucy's work, is somewhat curious, and I have therefore inserted the following sketch to explain this arrangement. HE are the western piers of De Lucy; ABD the small eastern piers of the choir; K and M the eastern piers of the straight wall of the same. Now the arch that connects K and H rests upon and springs from, the abacus of H, and is so united with it, that, viewed from the north side aisle, it appears to carry on the arcade of De Lucy's work in a regular sequence. The arch PH is succeeded in order by HK and KL. The moldings of course are different. As for the arch AB, it springs from a higher level than HK, and its moldings are made to abut, and interpenetrate with those of the arch KH, with that peculiar method that the Gothic masons delighted in. The abacuses of the pillars ABD are higher than those of H and K, because the former stand upon a high wall that serves as a screen of separation between the cast end of the choir and the low eastern aisles. The eastern face of the wall is ornamented with tabernacles of rich Decorated character. In the figure of arch-moldings, ( [in Figure 19n and] at the end of this history[in Figure 39 ],) Eis the arch-mold of the two eastern arches AB and CD,F is that of the north arch HK; and it will be seen at once that, although not exactly the same, they are the work of the same period. But G is the arch-mold of the southern arch FM, and this is wholly different, and as we shall see, subsequent. The manner in which this arch joins the piers E and D, is wholly different from that just described, as the junction of the opposite and corresponding arch with the piers A and H. Instead of resting upon the abacus of E, and interpenetrating with DC, an additional pier F has been erected, joining together the piers D and E, and receiving the arch MF, the span of which is thus made less than that of the opposite arch, and its moldings are freed from interference with those of CD, while the whole work is rendered more substantial. It is easy to discover that the piers H and A were once quite separate. But at present the interstice between them is filled up with a mass of masonry, G, which now connects them. It seems therefore that when the polygonal east end was first undertaken, it was intended to adopt the system on the north side, and that the eastern arches and first northern arch were built as we now see them. Perhaps the southern arch was built too and failed; at any rate, the present southern arch is of subsequent work, and erected, as I have explained, on a stronger and better plan; and the detached pillars at A and H were then bolstered by the way which I have described. The other pier-arches of the choir have the molding marked H in the figure [19 above and Figure 37], very similar to G. That these arches were subsequent to the eastern work is plain, from the way in which this arch L joins the arch K. The latter arch, and the wall above it, rests upon the pier K, so as to shew that they were fairly erected upon it; the arch L and its wall merely abut against the others, as subsequent work would naturally do. On the leads of the north aisle we may observe that the eastern part of the work includes the buttress which stands on the pier K, and the seam between the two pieces of masonry lies between that buttress and the next western window. Although the succession of the works is thus plain, the exact period of their erection is not so easy to determine, in the total absence of any documents. The work must have gone on slowly, and was probably carried up at the expense of the monastery, and not by any particular benefactor, therefore it has passed unrecorded. The piers are Decorated in form; the most easterly at V [in figure at left] ... is of older workmanship than the other three, although their capitals and bases are molded alike. From its excentric position upon the crypt pier below, it might have been erected without disturbing the Norman pier, which stood on the centre of that pier, and thus the polygonal end may have been built without taking down more than the circular apse of the Norman choir to begin with. For as the side aisles of this choir, which we shall presently examine, are the undoubted work of Bishop Fox, who held the see from 1500 to 1528; and the Decorated piers may be dated at 1320; it follows that about two hundred years elapsed from the beginning to the end of the work, and it is not likely that the monks were destitute of a choir or a roof to their high altar all this while. As in many other cases, I believe that they proceeded for their own convenience gradually, taking down only as much of the old building as they thought themselves able to replace with the funds in hand, or in prospect, at the time. On each side of the choir of St. Alban's there still remains three compartments of the original low vaulted Norman aisles, although the piers and pier-arches are of lofty Decorated work. In fact, Norman piers are so much thicker than the succeeding ones, as I have above remarked, in chap. II., that it becomes possible to cut down the front portions of such piers and pier arches, so as to leave room for the erection of their thinner successors, without endangering the fall of the aisles of the older work, which, notwithstanding this loss of dimensions, is still strong enough to stand alone [figures Figure 10 and Figure 11 shew the possibility of this. The manner in which the work of the side aisles now joins to the Norman work of the transept, confirms this view of the question. This junction is effected on the south side of the compartment J, (see general plan,) and on the north side of its opposite compartment W The external wall of the side aisles of the choir is most richly decorated with moldings and panel-work, with noble windows, in the best Perpendicular style, and its vault is considerably higher than that of the Norman side aisles, indeed it reaches nearly as high as the roof of the Norman triforium. This Norman vault, then, is cut down vertically on the south side of J, and on the north side of W, and the Perpendicular wall, instead of stopping at b and e, as would usually be the case, is carried on in front of and in close contact with this truncated Norman vault, so as to join the transept pier. This arrangement is shewn by the different tints on the plan, which are given to the Norman walls and the Perpendicular walls respectively. The sketch (fig. 20.) is taken from the floor of the triforium of W looking northeast. 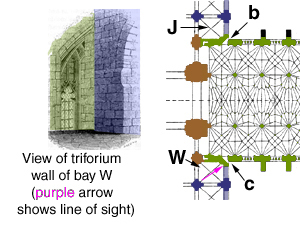 It shews the outer face of the Perpendicular wall in question at J, and the Norman wall of the triforium at B. It must be remarked, that a window is inserted in this compartment of the side aisles, similar to those in its other severies or ciboria. This would seem. to indicate an ulterior plan for removing altogether the Norman eastern aisles of the transepts. The Norman apse was first taken down about 1320, and the polygonal termination substituted. Then, perhaps thirty years afterwards, the Norman clerestory and triforium. of the straight part of the choir was removed, and its piers and pier arches reduced in front, as I have described, so as to make room for the present piers, pier-arches, and clerestory. Next, under Bishop Fox, about 1510, the Norman aisles were taken down, and the present aisles erected. If the scheme had been carried on in accordance with the views of the projectors, the eastern aisles of the transepts would probably have followed, and have been replaced by other arrangements in the style of the day. In this account I have no historical documents to guide me in fixing the dates. 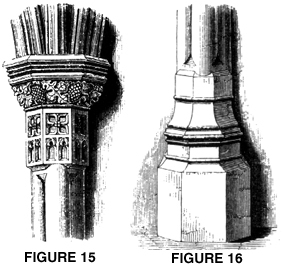 The moldings of the polygonal termination (see figures [37 , 38 and 39 ]) are Decorated in style, and resemble those of the lantern and other works at Ely, known to have been carried on from 1322 to 1328. Also the tabernacle work of the east face of the choir wall is of the same period. Hence, I have placed the date of the polygonal part at about 1320. 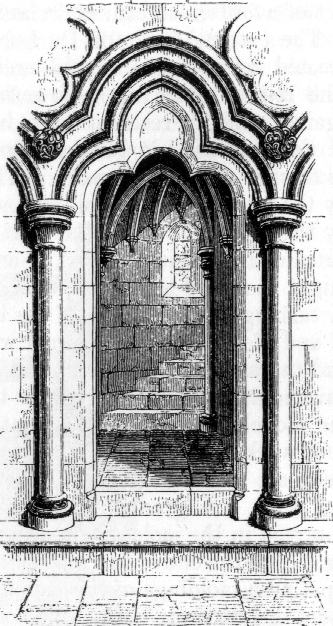 The arrangement of the compartment also resembles that of the lantern at Ely, and of the Decorated choir of Lichfield, consisting as they all do of two stages only, pier arch and clerestorv, and having a gallery or a1mra under the clerestory window, with a pierced balustrade in front. The tracery of the windows is, however, Perpendicular. But this tracery has been evidently inserted into the polygonal face of the north compartment, for the molding of the half monial at the jamb differs from that of the middle monials. What the cast window may have been we know not, the gable that now stands having been rebuilt by Bishop Fox, whose device is to be found upon it. The entire design of the choir has been copied from that compartment which was first executed. Hence it happens that its moldings G H (see figure of arch-molds at end [Figure 37]) appear later than the style of the composition. I am inclined to fix this part of the work at the beginning of Bishop Edingdon's period. Edingdon held the see from 1345 to 1366, and, as we shall see in the next chapter, the great work of the nave was begun by him, and occupied his successors, Wykeham, Beaufort, and Waynflete. This may account for the delay that took place between the erection of the central part of the choir and of its side aisles; for the more important work of the nave, rendered necessary by its ruinous condition, must have absorbed all the attention and funds. There are several details in the clerestory of the choir that resemble similar ones in Edingdon's work. For example, the cusps of the window tracery are terminated with flowers instead of being simply pointed, a fact which I shall presently shew will serve to identify Edingdon's work at the west end of the nave. The tracery of the clerestory windows in the choir is greatly inferior to that of Fox in its side aisles, or to that of Wykeham in the nave, but has many points of resemblance to that of Edingdon in the nave. The side aisles of the choir are identified with Fox by his badges and emblems, which abound in this part of the work. The east end gable is crowned by his statue resting on his emblem, the pelican. The north corbel of the hoodmold of this east window is a most characteristic portrait bust of a bishop, evidently Fox, from the resemblance to his bead above. The flying buttresses, which the jointing of the masonry prove to have been subsequent insertions into the wall of the clerestory, have also the pelican of Fox carved upon them. The insertion of these buttresses is explicable if we recollect that the walls of the clerestory have just been attributed to Bishop Edingdon. The roof of the choir is of wood framed to imitate stone, but the vault of the side aisles is a fine piece of stone lierne work. These aisles, as may be seen from the account given in these pages, present a curious and instructive mixture of style. Thus the pier H (fig. 19.) 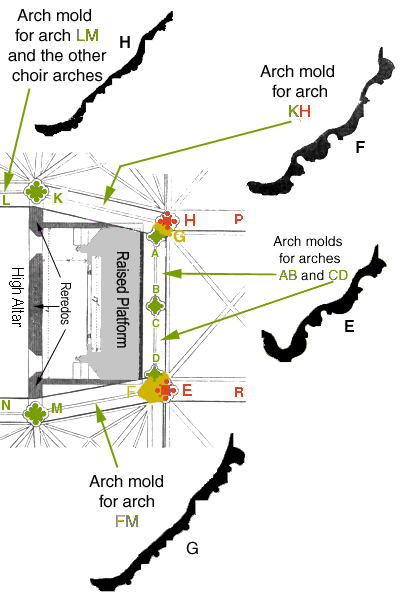 receives an Early English pier-arch P H on the east side, a Decorated pier-arch H K on the west, an Early English vault and ribs on the north-east side, and a set of Perpendicular vault-ribs on the north-west. The rib that runs northwards from this pier is halved, and has Early English moldings on one side, and Perpendicular on the other Also the pier-arch H K has a Perpendicular wall-rib running parallel to its Decorated moldings on its north side. I have hitherto employed the word choir in its architectural sense. But in this cathedral the ancient Norman arrangement being retained, the actual " choir of the monks," the place where the stalls are fixed, is under the tower, and that which is termed the choir, is proved distinctly to be the presbytery. The high altar was fixed originally between the extreme pillars KH (fig. 19,) and the shrine of Swithun and the other saints appear to have stood behind it. A lofty and magnificent reredos now extends from pillar to pillar, immediately backing the altar; and the space behind it to the east, including the polygonal part of the choir, is thus cut off and separated ; a door oil each side the altar leads to this space. The feretory, which is cut off from the rest of the choir by the high reredos, was once of course visible from the choir; at the extreme east end there are still to be seen the ruins of. its ancient arrangement, shewn in the plan, (fig.19,) The sides of this chapel are at present occupied by two chantry chapels, that of Gardiner on the north, and of Fox on the south. At the east part is a raised platform, seven feet broad, extending quite across. Its upper surface is now three feet above the floor, but was originally much higher; steps at each end gave access to this upper surface, and in front there are the remains of a hollow place, which, from the piers and other indications that remain on the floor, evidently had an arcade in front of it, over which the pavement of the platform extended so as to make its breadth about ten feet in the whole. This platform probably sustained the shrine of St. Swithun, and also those of SS. Birinus, Edda, and Ethelwold, or of some of them, for these are recorded as the especial patrons of the church. Whether the arcade below was appropriated to the reception of smaller relies we cannot tell. It was usual to raise up the shrines of saints, and leave a free space under them. 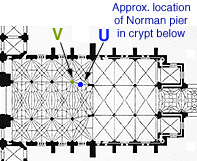 Indeed the most common way was to place the sbrille of a notable saint lit all isolated position in the midst of the feretory, with open arcades below, as in the case of Edward the Confessor, Thomas 4 Becket, &c.
The Norman crypt is at present filled up with earth to a considerable height, and is moreover obstructed in all directions by masses of brickwork raised for the reception of coffins, for the water lies so near the surface that it is not only impossible to bury under the pavement of the original crypt, but it has also been thought advisable thus to cover up the lower parts of the pillars and walls. The structure of the crypt appears to terminate westward at the eastern piers of the tower. But the raised platform above the crypt, which includes the presbytery and its aisles, and all the eastern part of the church, is also extended under the central tower, and beyond it to the second pillar westward from the tower pier. 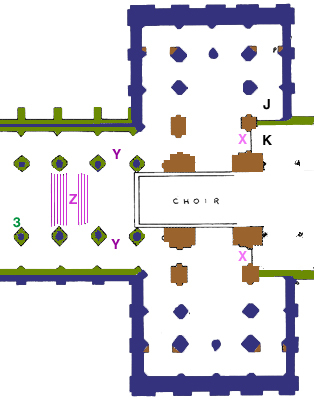 At this point a flight of steps, with an intermediate landing, or " half pace," at Z, (...[see figure left],) connects the raised pavement of the choir with the lower level that prevails in the nave and transepts. This lower level also joins to the higher by means of lateral steps at Y in the side aisles of the nave, and similarly by steps at X access is given from the transepts to the side aisles of the presbytery. As the compartment J in the east aisle of the north transept, and the compartment K in the side aisle of the presbytery, are thus on the two different levels respectively, the door of the crypt is conveniently placed in the south side of J. The stalls extend from the western corners of the eastern tower-piers to the first pier of the nave, and are terminated on the north side by a rich pulpit of wood, which bears the name of its donor, " Thomas Silkstede, prior," footnote p on different parts of it. The woodwork of the stalls is exceedingly rich and beautiful. It has, however, been subjected to various alterations, that may be easily detected upon examination. They are of early Decorated work, and their canopies and gables bear considerable resemblance to that of the tomb of Edmund Crouchback, in Westminster Abbey, as Milner has most truly observed. footnote q This would place their date about the year 1296. The desks and stools in front of the upper range bear the initials of Henry VIII., of Bishop Stephen Gardiner, Dean W. Kingsmill, and the date 1540. Formerly a " pulpitum," or rood loft, extended from pillar to pillar of the nave over the landing (Z) of the steps leading to the choir. This bore the great cross of Stigand, described in a previous chapter.. footnote r The space between this and the stalls was probably occupied by chapels and altars. The chantry chapel of Edingdon still remains on the south of the landing at 3, and the state of the piers on the north side shews that they were formerly covered by some wood or stone work now removed; for, as we shall presently see, the pillars of the nave, originally Norman, have all been eased, and altered into Perpendicular. But in these piers the upper part only is so changed, and the lower still shews the old Norman work, which it was not practicable or necessary so to change at the time the alteration was made, because they were then concealed by some decorations connected with the western entrance of the choir. This, whatever it was, seems to have been removed after the Reformation; and in the reign of Charles I. a screen of the composite order was erected, as a mere wall of separation, at the west end of the stalls, between the two first piers of the nave on each side; for in this cathedral the organ is not placed over the west door of the choir, but under the tower-arch of the north transept, consequently no gallery is required, as usual in other cathedrals, and a single wall is sufficient for a screen. The classical screen is now replaced by one more in accordance with the style of the building, the work of the late Mr. Garbett. Before quitting this portion of the church, I must mention two chapels formed in the eastern aisles of the south transept, by screens of stone tracery work. The south is called Silkstede's chapel, because the letters of his Christian name, Thomas, are carved on the cornice or crest of the stone screen, but in such a manner that the M. A., the monogram of his patroness, the Virgin Mary, are distinguished from the rest; together with the skein of silk which the rebus of his surname. 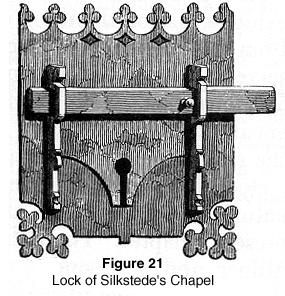 Fig 21 is a lock of this chapel. 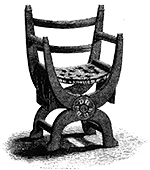 The bench, of which a portion is shewn in fig. 22, is preserved in the south transept; from its rudeness of construction and its ornaments, it might be coeval with the transept itself; but I have not examined it with sufficient minuteness to give a decided opinion upon it. The north chapel is remarkable for the elaborate and beautiful iron work with which the openings of its tracery are defended, of which a portion is represented in figure 23.